Having spent an appreciable amount of today surfing the net and reading posts by other political bloggers on the topic of “How I’m voting tomorrow”, some adding “and why”, I have finally succumbed. So I’m going to tell you who I advance-voted for last week, and why I ruled out the various other options that have peppered my in-box with information in the past few weeks. Firstly, I’m (as regular readers may know) a voter in the Wellington Central electorate. I’ve blogged enough times about our ‘new kid on the block’, James Shaw, who is standing in Sue Kedgley’s stead as Sue is retiring at this election. So it will come as no surprise that I have voted two ticks Green, one candidate vote for James and a party vote Green, which has actually been my Wellington Central strategy since I moved back into the electorate before the 2002 elections. My long-term strategy is actually anchored to a deep distrust of the Labour leaders, and especially Phil Goff who was the relevant Minister of Defence, since the first SAS sortie into Afghanistan, which they have repeatedly lied about in Parliament and media questions. There have been books written about this period of our recent military history, most recently Nicky Hager’s Other People’s Wars, and also this one, an official 50th anniversary history sanctioned by the SAS and NZDF hierachy. Woops, they should have cross-checked with Hansard to find out where their line of plausible deniablility stood. I genuinely like Grant Robertson; I know very little about Paul Foster-Bell, but he seems to be a nice young man, if a little like dishwater. I have heard the Libertarianz, ACT, ALCP, Pirate Party and New Economic Party’s candidates speak at various Wellington Central forums, and I have been very much entertained by their presentations. My view of National as a party has been refined over many years (nay, decades…) of interaction at a local level with Bill and Mary English, whose many children overlap three of mine in ages, and have shared educational institutions with them from primary through to secondary. I have heard Bill’s spiel about private schools getting a hard deal so many times I could practically give it myself, if I felt motivated. I do not. It is essentially the selfish howl of an over-entitled man, pleading special interests to those who are similarly selfish and over-entitled, and as a former public servant in the Education field, I have always found that position to be repugnant. John Key has further compounded the selfish policy ground of National by busily driving the country into the ground, slashing taxes for the rich, while cutting services to the poor, and throwing public servants on to the redundancy scrapheap. This is such short-sighted policy that I am astounded, until I reflect on the behaviour exhibited by the Coates Government during the Great Depression* – they protected Farmer’s incomes, forced unemployed and starving men into work gangs, sleeping by night in the fields next to the roads they were ‘mending’. This is the Government that lost to Micky Savage’s first Labour Government in the election that led to the institution of the welfare legislation that gave us such a stable and prosperous period in the years immediately after the war – when the generation that are today’s Baby Boomer retirees were brought up. National appears to have no clue that by giving tax breaks to the well-off, demonising those who can’t find work, sacking public service employees, and bailing out failed businesses who should have been allowed to fail instead of continuing to trade, they have merely repeated the worst of the excesses of the Coates Government. Those who do not heed history are doomed to repeat it. The lessons of the past might be well learnt by John Key and his cronies, as he tries to cynically manipulate his way into another term, with asset-stripping as a Key policy for the next three years,and a probable golden parachute lurking outside New Zealand once he’s overstayed his welcome. Aah, but what about Labour’s future plans? Well, I’ll be interested again when Goff finally gets rolled by Grant Robertson. This election, despite a strong finish, the Labour leader has looked weak, indecisive and feckless, and made me glance wistfully at the “I miss Helen” button that I bought from Unity Bookshop shortly after Helengrad was vacated when her Helenship departed for the UNDP. If you wish to ascertain the accuracy of my statements about the Coates Government, I thoroughly recommend the works of Tony Simpson, “The Sugarbag Years”, published in 1975, and “The Slump”, published in 1990, both available in Penguin NZ editions. Should be available in any public library with a decent NZ History section. Or you could read any of the biographies of John A Lee, Michael Joseph Savage, Peter Fraser, or indeed anything written about the Coates Government itself. Here ends the history tutorial assignment, don’t post me the answers, I’ll be happy enough if you just educate yourselves. Last night was a very busy show. Hutt South is well-supplied with candidates, and so we heard from six (count’em, six!) 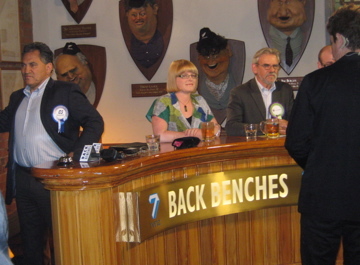 political parties, although only five could fit along the bench, with Trevor Mallard and Paul Quinn very closely placed elbow-to-elbow. Holly Walker, our fabulous feminist Green candidate was next along the row, and she was bookended by Rob Eaddy of United Future, and finally Alex Spiers from ACT. The round-up was completed by Graham Coupland from the re-branded Conservatives, which those of us who are older may recognise as the Christian Heritage party of yore. Damian and Wallace were contending with a very packed house, and then an unexpected and seemingly unwelcome (and, some considered, very rude) interruption by a small but vocal group from Occupy Wellington, who chanted over the top of the presenters while Wallace was quizzing the panel on a policy issue. There was the usual amount of banner and placard waving, ALCP managed a bit of screen-time for one of theirs, and the campaign against MMP had their placard removed by the producer after some overly aggressive behaviour. Got you interested yet? View the whole episode here on TV7’s on-demand link, and while you’re paying attention, support the retention of TV7 here. 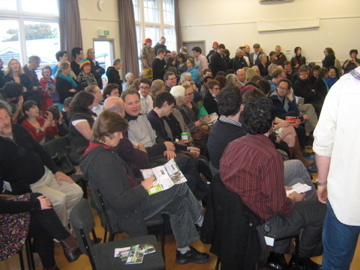 This is the famously ‘most fun’ candidates forum in Wellington, in the Green heart of Te Aro. It was an awesome night, the chairs were full half an hour before the stated starting time of 7.30pm, and by the time the candidates had all arrived, there was no standing room, and a build-up of late-comers hanging on the ramp outside the huge windows (all opened fully) peering in and listening to the speakers with assistance from the sound system courtesy of local Aro events manager Martin Wilson. 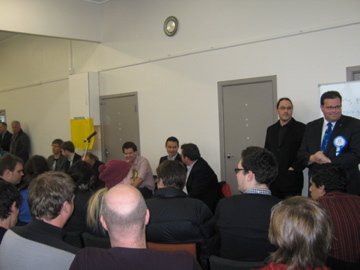 The Candidates speaking were Grant Robertson (L), the sitting MP; Paul Foster-Bell (N); James Shaw (G); Stephen Whittington (ACT); Gynn Rickerby from the Pirate Party, who spoke first as he had to leave for family reasons; Reagan Cutting (Libertarianz); Laurence Boomert from New Economics Party; and the perennial Michael Appleby (ACLP), who is always such a good showman, and well-liked by Aro residents and regulars. There was a sausage sizzle, popcorn, warm spiced orange juice, macaroons, and eventually mulled wine, all at ‘gold coin’ prices to support the Aro Valley Community Centre; the half-time break saw much chatting and slurping of various cups of beverages, and popcorn chomping. James made some excellent capital out of responses to questions directed at other parties, throwing out replies that covered pretty much every policy angle the Greens own, while emphasizing the core three issues of jobs, clean rivers, and child poverty reduction. The rest were pretty much repeating the same sentences I’ve heard on the past two nights on the Welli campaign trail, with Whittington in particular sounding like a stuck record. Appleby answered every question with a reference to industrial hemp as the wonder agricultural product of the future, saving exports, tourism, and leading to biofuels advances, all of which was received with good humour by a jovial crowd. The audience were mostly happy and raucous, the timing of speeches was kept strictly, and enforced by water-pistols in time-honoured fashion, while a little girl held sway over the vuvuzela to sound when the speeches ran out of time; this is my home suburb, my favourite place to talk about politics, my favourite event of any election year, and this year as ever Aro Valley did themselves proud. So, astonishingly, I am going to post a link from stuff, ‘cos they actually did quite a good write-up here, complete with some video shot during the meeting. Enjoy. Welcome to the vibe of ma ‘hood.